In an investigation, the Oklahoma State Department of Education found one Tulsa Public School was falling short on helping special education students. 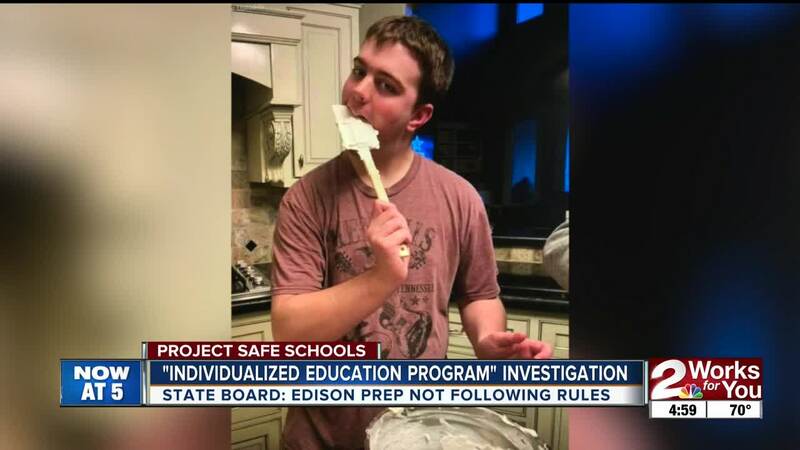 After a complaint was filed against Edison Preparatory High School, the Oklahoma State Department of Education reported the school was not following the regulations of the individualized education program or IEP. This program is a written statement for each individual child with a disability, designing unique goals for that child to meet throughout the year. “They would look at where he is now and they would project a goal of where they would want him to be," said Bill Brazelton. Brazelton’s son, Nate, is in the middle of the autism spectrum. He had a personalized IEP at Broken Arrow High School. The State Department of Education said the problem at Edison was that the school was using the same plan for most of the students on an IEP. Brazelton said individualized plans are important because each child learns differently, including his son. All District administrators, special education staff, special education teachers, and special education service providers, shall complete a Qualtrics survey provided to the district by the OSDE-SES. District shall distribute the survey accordingly, and ensure all mentioned parties complete the survey no later than Friday, April 30, 2019, at 4:00 P.M. The OSDE-SES will provide the results of the survey to the District. Conduct a review of goals for all students in the district who receive special education and related services, in order to determine the number of times the four goals mentioned above are utilized at each school site in comparison to the number of students with reading and written expression goals, and identified needs in reading and written expression. Submit a report of the findings no later than April 30, 2019. Utilize report findings and survey results to develop a plan to be implemented District wide to correct all found instances of noncompliance regarding goals and progress reporting. This plan shall be submitted to the OSDE-SES for approval no later than May 31, 2019. District special education administration/staff must conduct training for all District special education staff on the approved plan and the creation of individualized goals. Evidence that such training has occurred must be documented (i.e. training schedule(s), agenda(s), curriculum/training materials, and legible attendee sign-in sheets.) Evidence must be submitted no later than August 30, 2019. By May 31, 2019, submit an assurance statement signed by the superintendent and school board members, ensuring that all District IEPs will be developed pursuant to 34 C.F.R. & 300.324, and that the training listed in directive 4 will be implemented accordingly. 2 Works for You reached out to Tulsa Public Schools. "In October 2018, a state-level complaint was filed with the Oklahoma State Department of Education on behalf of a student with a disability at Edison Preparatory High School. In December, the OSDE returned a decision finding that while Tulsa Public Schools was compliant in two of the four areas outlined in the complaint, we were found to be non-compliant in the areas of measurable goals and timelines for implementation of services. We take our responsibility to all of our students with the urgency, care, and concern that our young people deserve. Over the month of January, we worked with the team at Edison to implement the appropriate corrective actions to ensure that we are in full compliance in all areas of the student’s Individualized Education Program (IEP). Our Exceptional Student Support Services team will continue to work with Edison and all schools in our district to ensure that we are providing the best possible supports to every exceptional student in our care."